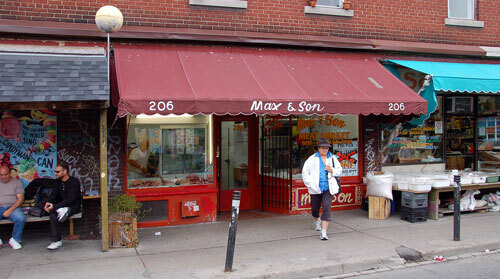 It talked about Solly, the son in Max & Son, a Kensington Market butcher shop. Yesterday was Sol’s last day. Max & Son, a fixture in Kensington for 54 years has closed and the building has been sold. I was anxious to visit one last time. So we walked down to the market and bought a steak from Sol for dinner. Sol’s family came to Canada from Siberia via Austria back in 1949. His dad, Max, opened his butcher shop in ’55. Sol started working with him when he was 16. Kensington is a microcosm of Toronto. It’s ethnic diversity is what appeals just like the mother ship and it constantly evolves. Some like Sol and his parents stay for decades. Others move on. Rents have skyrocketed lately as development from the downtown core creeps west. I wonder as I write how it will affect the market. Besides Max & Son, I can think of several other shops that have come and gone through the years. Akram’s and his Middle Eastern delicacies and special three bean falafel, Tiger and Tiger’s, and who could forget the Egg Lady. She sold eggs and not much else in an Augusta Avenue store with no sign. Vintage stores in old Victorians still take up the bottom half of Kensington Avenue. Courage My Love was the first. It opened back in the 70s and is still going strong. I love who ever thinks up its color schemes. Richly textured, eye-catching, and very hard for me to resist. Exile is another survivor. You can’t miss its yellow and red exterior. I bought a 60s poncho here complete with fringe that I still wear every fall. Yesterday, we met a guy at KOS, a well-known diner which recently moved into Kensington from Bathurst and College. We got to talking about the market. He used to work at Astral, a vintage store that was on Kensington. He told us how one day a woman from San Francisco came into the store and bought an old Levi’s jacket. Later she told the store owner she was from the Levi Strauss Museum and the jacket was one they had been searching for. Astral didn’t know what it had. He also told us how Club Monaco designers used to browse Astral and the other vintage shops for inspiration I wonder if they still do. 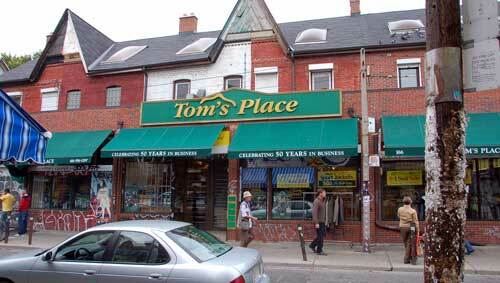 My brother-in-law’s mother first steered me to Tom’s Place. It’s on the north side of Baldwin which intersects Kensington. Pretty non-descript on the outside but inside, crammed with new designer labels. Upstairs, more of the same for men. I bought an Ellen Tracy raincoat from here that I adored. Casa Acoreana is at the corner of Baldwin and Augusta. It’s owned by three brothers who I think grew up around the shop started by their father. It’s possible it was one of their sons who served me yesterday. 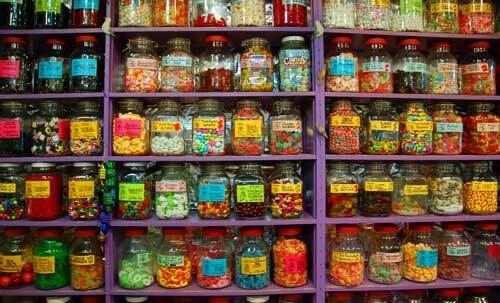 This place is stocked with coffees, teas and jars of candies from around the world- the best candy shop in the city in my opinion. Licorices include salted Dutch varieties and my favourite – dark chocolate ginger jellies from Australia. Louie’s cafe was a later addition to Casa Acoreana and has become a popular Kensington hangout for people-watching. 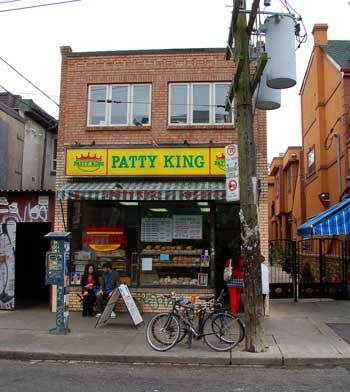 Patty King still has its bread puddings, homemade ginger beer and meat patties and Emporium Latino was busy serving its yummy papusas in a mini storefront cafe. It started as an even smaller space at the back of the shop. 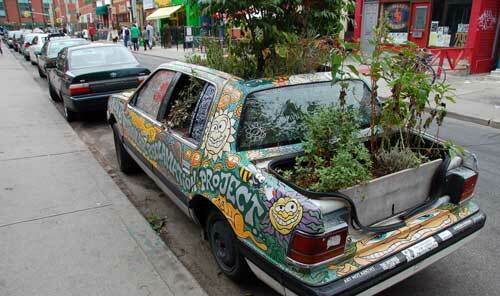 Further up Augusta, we stopped to take a pic of the Augusta garden car. That’s when we spied La Palette, a little Parisien-style bistro that reminds me more of Montreal. The guys behind the bar caught us looking and waved us inside. We had a great meal here one night not too long ago and yesterday, we promised them we’d be back. Read the Debra Black story in the Toronto Star. Hey!Judy and Glenn I’m JOSETTE Laure’s mother and i’m too happy to visit your website Please give me news!!!!!!!!!! 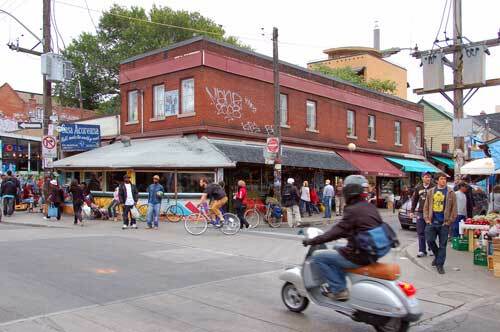 Wow, these places look like real gems, I’m sorry I missed Kensington Market, but I’ll definitely be back and who knows, maybe even manage to get the right streetcar next time!